A Sri Lankan boy whose family sent him to the UK for a "better life" after their fishing business was devastated by the Asian tsunami has gone missing. 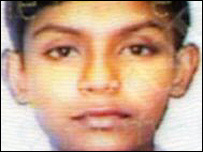 Kajanthan Annathurai was last seen dropping his younger cousin at North Primary School, in Southall, west London, on 29 September. The 14-year-old, who does not speak English, came to live with his aunt and uncle in Southall five months ago. The tsunami hit in December, killing at least 200,000 people in 13 countries. Kajanthan is 5ft 2ins, of thin build, with brown eyes. He disappeared after dropping his eight-year-old cousin at the school at about 0815 BST. Police have been looking at CCTV footage from the area to find clues to his whereabouts. He was last seen wearing a blue T-shirt with a two leaves crest on the front, with dark jeans or trousers. He wears clothing for children aged 8-9 as he is small.